UNCG students talk with a prospective employer at the Fall Full-Time Career Fair in September. 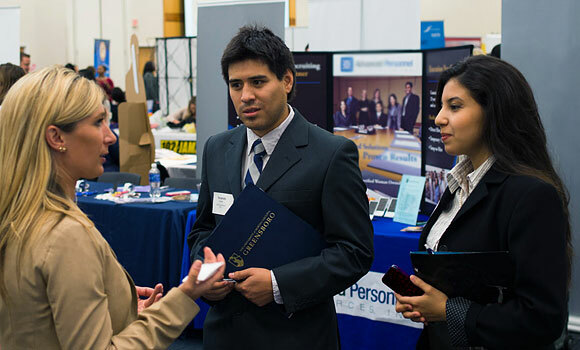 The Fall Full-Time Career Fair and the Spring Career Fair are the university's largest annual recruiting events. Where can you find Pepsi, Target, Volvo and Hanes Brands all together in one room? UNCG’s annual Spring Career Fair. On Wednesday, March 2, nearly 100 employers will arrive at UNCG’s Elliott University Center to recruit students and alumni of all majors for full-time and part-time jobs and internships. The event, which takes place from 10 a.m. to 2 p.m. in the Cone Ballroom, provides students the opportunity to meet with some of the top employers in the state and across the nation. In addition to Fortune 500 companies, prospective employers include local businesses, city governments and nonprofits, among others. The event is open to both undergraduate and graduate students, and underclassmen are encouraged to attend to network and explore different career paths. All students must wear business suits and bring their student ID for registration. What’s the key to landing a job on Wednesday? According to Pegg, it’s all about research. The UNCG Career Fair Plus app is the perfect resource to get the most out of the career fair. The free app for IPhone and Android includes in-depth descriptions of participating employers, a detailed floorplan of the event, elevator speech tips and a list of common interview questions. UNCG’s Career Services Center also provides resources for students leading up to the event. The center’s peer career ambassadors – trained UNCG students who assist with job preparation – will be available from 10 a.m. to 4:30 p.m. Monday through Friday to review resumes and discuss career opportunities (no appointments necessary). While the Spring Career Fair is the largest event of its kind this spring, it’s not the only one. UNCG’s Education Career Fair takes place March 16 from 10 a.m. to 2 p.m. in the Cone Ballroom. More than 60 school systems from North Carolina and neighboring states will be seeking teachers for all grades and subjects, as well as administrators, counselors, social workers, nurses, media specialists, speech pathologists and dieticians. For more information about the Spring Career Fair and the Education Career Fair, visit csc.uncg.edu.